A product or service to fulfill that need. These three building blocks are universal across a variety of business models ranging from very simple (a lemonade stand) to complex (a multinational enterprise) to extremely complex systems (global economy.) What the value triangle shows is that they all have the same structure because the business system is based on these three fundamental or atomic elements. Much like how Ram Charan used systems thinking to show that a one-person business of a street vendor and the CEO of a global multinational company were essentially driven by the same metrics, the value triangle provides a construct for understanding different business models with their linkages and interactions using systems thinking. Customers: These are typically people who are passing by your neighborhood. Products: In this case, you have one product, which is lemonade. The product is made up from multiple ingredients (raw materials) such as lemons, water, sugar, etc. Money we get from selling the product is called revenue. Money used to purchase the raw materials is your input costs. Assets: There are different types of assets. To keep things simple, we focus on just two types. First, to transform the raw materials into lemonade, we need things like pitcher, spoon, etc. as well as other necessary assets like the stand to set it up on the sidewalk, cups to dispense, and some signs to help sell the product. These are your “operating” assets. Now let’s say that your older sister helped you to drive to the grocery store, tell her friends to come by, help make change and tally up your profits. She represents your “people” assets, and you pay her a small fee for her assistance. Money that is used to pay for your operating and people assets is your value-add or transformation costs. If you think of the lemonade stand as your “money machine”, then how effectively you manage the value triangle of customers, products, and assets ultimately determine how much money you make from it. Now, let’s look at a more complex business system. Complex value triangle example: Building airplanes. Customers: Typically airlines, defense departments, rich individuals, etc. 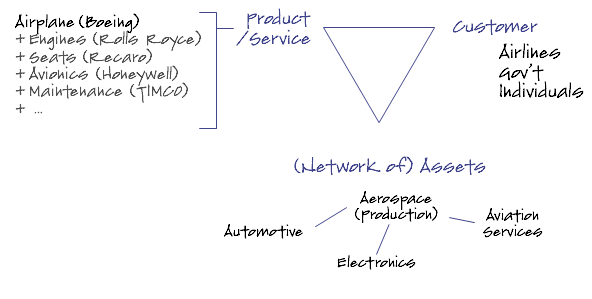 Products + Services: Building an airplane requires multiple products and services from hundreds or thousands of suppliers spanning multiple industries. 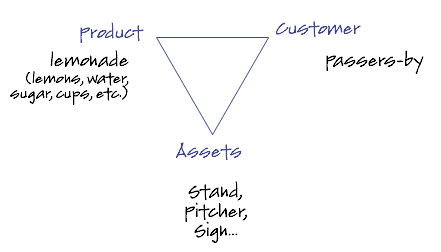 So here we see how the value triangle helps us deconstruct an entire business ecosystem to understand how the individual “money machines” must work in concert to create value for their respective customers and shareholders. Now let’s move on to a system whose complexity is greater by many orders of magnitude because we are now trying to balance the objectives or many stakeholders (business and society) with very diverse objectives. Very complex value triangle example: An economy. Customers: The “customers” here are the population of a country who consume products and services. In the case of the United States, we are talking about over 300 million people. Products/Services: The total output of an economy in captured terms of GDP, and in 2009, the US accounted for $14 trillion dollars in goods and services provided. 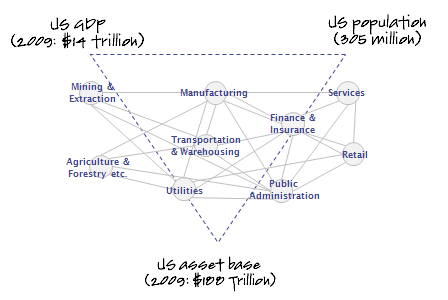 Assets: How we think about the “assets” of an economy can be quite complex in terms of its tangible and intangible aspects: natural resources, infrastructure, education, health, political stability, laws and liberties, etc. In any event, someone had to come up with a estimate, and for the US that number was $188 trillion dollars in 2009. Customers: If the “customers” are represented by the total population of the planet, then it is estimated that in 2009 that number is 6.8 billion people. Products/Services: The total output of the global economy or GDP was estimated to be $62 trillion. 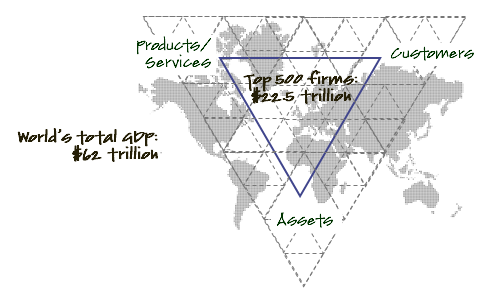 Assets: The planet’s tangible (and mostly finite) and intangible resources. From a purely physical viewpoint, we have just one fixed asset – the earth. Its physical resources are finite (e.g., arable land, potable water, crude oil) and it is a closed system. Physically, this closed system is divided into countries and governance of its “asset base” is fragmented along geographical boundaries. Given that the total population of the planet is expected to triple between 1950 and 2050, the laws of demand and supply dictate that the value of its finite resources will increase. In contrast, let’s look at it from the viewpoint of a global business: A multinational enterprise sells to customers in multiple markets, their supply chains source from multiple markets, and as such, their asset networks span multiple markets. In other words, they operate virtual value triangles that transcend geopolitical boundaries. Consider this: In 2009, and the largest 500 companies in the world accounted for $22.5 trillion dollars – or roughly a third of all goods and services provided. Thus, to understand globalization and its impact on various economies, we need models and frameworks to deconstruct and decipher the myriad of value chains that are at the core of the global money machine. The basic building blocks (customers, products and services, and assets) of the value triangle gives us a starting point to comprehend the “DNA” of these global value chains. ← Does business have a “shape”?